Login is located in the upper right corner of all pages. Here's a comparison of R-134a to R-12 refrigerant vapor pressures at specific temperatures. R-134A has a slightly lower pressure at evaporator temperatures (30-40 degrees), but R-134a also has a much higher pressure at condenser temperatures (120-150 degrees). NOTE: For best heat transfer, condenser temperatures should be 30-40 degrees hotter than the ambient air temperature entering the condenser. 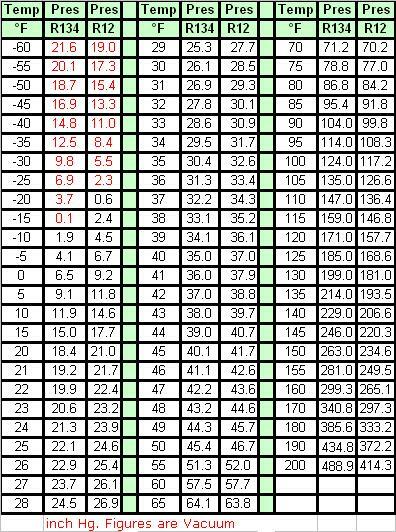 Brought this over from the old site as it's by "ACProf" and valuable information as a tool in the form of a chart. Thanks, I refer to it often. Thanks Tom. That's a nice chart to have posted. I created a channel called A/C Reference and Resources for this type of material. Readers: That chart do note how many cars are and have been around without a high pressure port. So when or if a problem comes along you want to know the pressure and without a port can quick use a touchless infrared thermos on lines and know the pressure! This info can be obtained if the vehicle's now computer monitored pressures can show on a scanner most folks are unlikely to buy to be able to get streaming info of what's going on. Places that matters include many not just a few will shut off electric fans if not needed or increase their speed for the condenser. If static pressure in a system not working is below the listed pressure with known temps you about know that system is almost empty and not be wasting time and money move on and find the leak which would be pretty fast if it was recently working. 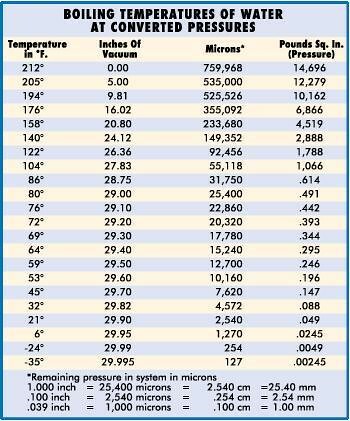 Chart of boiling points of water in a system posted by Cornbinder89 should also be here. Super important to know how accuracy matters! Credit to him for this I just don't want to lose this! Tom, it came from the 3 thread in this section, you were the one who posted it, so credit goes back to you!